73. New Receiver (2005 -10-01 to 2005-10-05) - I picked up a ICOM IC-R7000 receiver from EBay and it has been delivered. Now I am attempting to get it running in the system. 2005-10-05 Edward Cole gave me a roadmap of tests to make on the system. I'll follow through it and show the results here. 1- test the IC-7000 with the WSS. 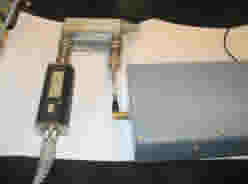 To get a weak signal this will require the use of a coaxial attenuator or separating the WSS from the receiver as follows The output of the WSS, low position is -29.75 dBm, Hi position is -5.3 dBm as measure with this setup. I have modified the WSS so that I can switch in or out the last two stages of the oscillator amps. range below this so I have to depend on the attenuator itself for the rest. With only the attenuator I can get down to -104.76 dB so I had to add an additional 10 dB attenuator using a Midwest Microwave 263 attenuator. 50 dB 80% quieting. S Meter at 2.5. Signal of -110.86 dBm. 70 dB Powering the Line amp on increases the noise level but no quieting. S Meter full left at 1.0 Nice loud signal in SSB mode. Looks like the filter adds about 1 S Unit of insertion loss. 6- add the LNA and you should see a huge increase in signal (several s-units) Attn at 70 db - full quieting, S Meter at 7. This is a calculated signal level inserted into the LNA of 130.86 (attenuator string) + 9.51 dB from the RG-8 = -140 dBm. Seems to be working. For an additional test I added 30 dB more to the attenuator string and at with the attenuator set at 50 dB I got about 50% quieting and a S Meter reading of 5. 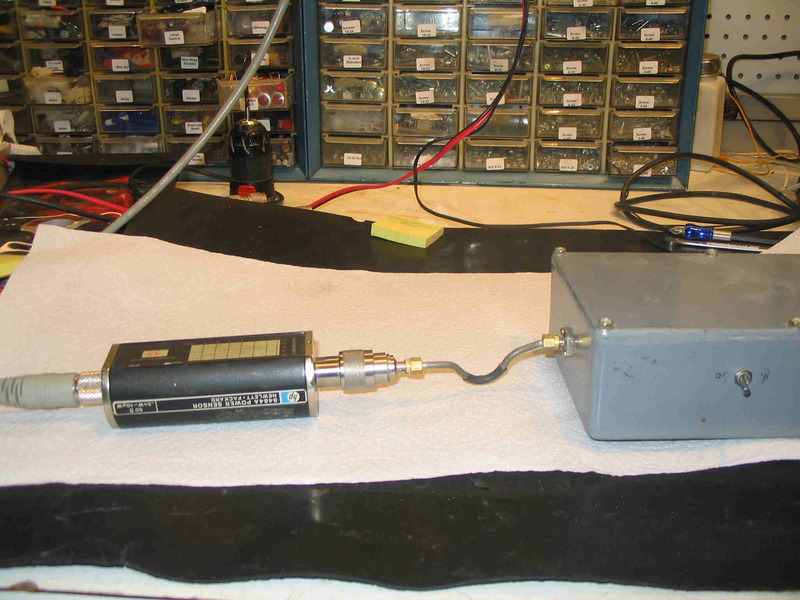 7- attach LNA to feed horn and place WSS in front of feed horn (this should equal or see more signal than step 6) Just pointing the feed horn toward the WSS quiets the receiver with the attenuator set at 70 dB and the additional 30 dB attenuator in the string. S Meter at 7.5 Seems to work. note if you do not see this it may indicate that your feed horn is not working well or that its placement in front of the dish is not correct (centered and at the focal point) I mounted the horn back on the LNA and tuned to 1575.42 and then moved the dish around to Az 221.25 and El 36 degrees and there was the satellite. This finishes the problem hunt but I'm not really sure what solved it. It could have been the electrical connection between the horn and the LNA; it could have been a loose connector (somewhere) or it could have been simply not pointing the antenna in the right direction. I can't hear any of the birds that have been pointed out. I do hear a signal at 1379.913 that Greg said was the L4 carrier but it is very weak and although I can move the antenna and it disappears I have to move it about 20 degrees in either Az or El before it goes away. Doesn't seem right to me. I then just let the WSS run unconnected and could see the LO and line amp pull it out of the mud when powered on. That seemed right. Switching the filter in or out doesn't change the signal and that seems right as well. When I put the LO assembly back in the prime focus it still seems to work but I still can't hear any of the birds (other then 1379.913). 2005-10- 01- Receiver powered up fine and seems to work. As I had heard the internal power supply in this unit runs *very* hot, so hot that you cannot touch the rear of the unit, and should be replaced with an external unit. This was done by replacing a rear panel Molex jumper with a run of heavy gauge wire down to my Astron 12 VDC supply.